The airport was once a place associated with stress, queues and general discomfort, however over the last decade, cities around the world have helped to take the edge off a little, by building exceptionally designed, clean, well-functioning airports. Virgin Atlantic’s new Clubhouse boasts an Austin Powers-meets-uptown mod feel, complete with a red leather sofa and purple lighting. Enjoy a cocktail at the ultra-chic cocktail lounge or take a seat in the brasserie dining area, where you’ll be served a delicious selection of a la carte meals, desserts and fine wine. But it’s the Clubhouse Spa, featuring Dr. Hauschka products and treatments, that really makes the JFK Clubhouse a standout layover option. The typically British herringbone print, velvets and crystal chandeliers of the Concorde Room at Heathrow collaborate to form a relaxed, traditional-style sitting room. Its charm comes in the fact that it is not particularly fashonaqble or at all modern, but instead, this is a ‘homely’ retreat – that is, if your home comes with full waiter service, complimentary wines and Champagne and private, hotel-style cabanas with day beds and en-suite bathrooms. Etihad’s first-class lounge is a buffet of indulgence. Staff nannies take care of the little in the kids’ retreat, decorated with vibrant beanbags and toys, while over in the Six Senses Spa, parents can indulge in a complimentary treatment. And that’s not to mention the Champagne bar, the cigar lounge and the incredible a la carte dining or even dinner at the chef’s table. At The Pier, Cathay Pacific’s glass-enclosed first and business-class lounge, travellers will find incredible cuisine such as freshly made Japanese noodles at the Noodle Bar and fine dining at the Haven restaurant. Sip champagne on the leather armchairs or refresh inside the pebbled showers – what travel stress? Modern, polished and sophisticated, Qantas First Lounge, would appear to be the norm of airport ‘luxury’. 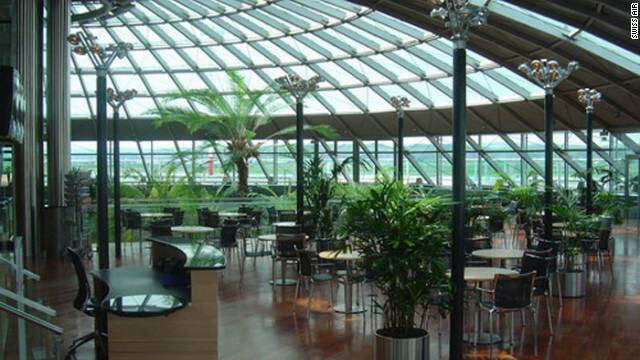 However, with a 98-foot, 8,400-plant vertical garden – this is not your average airport lounge. It is cleaner and lighter and better yet, part of the garden is incorporated into each of the Payot Paris day spa treatment rooms, so it feels more like a rainforest than an airport. The upper floor of the lounge was designed by Marc Newson and includes an open kitchen restaurant serving food by Australian chef Neil Perry. Is it a mall? Is it a hotel? 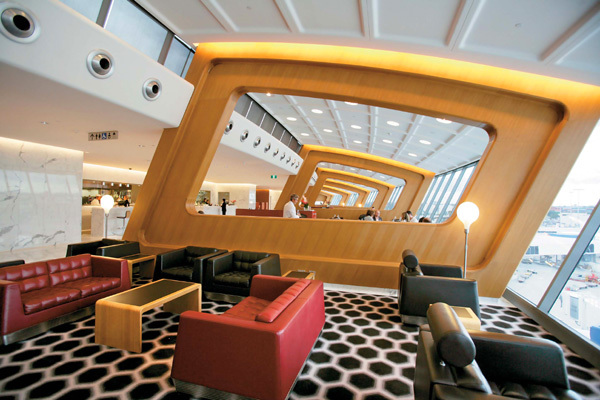 No it’s the massive Qatar Airway lounge at Doha airport. Never ones to be content with doing it on a small scale, the Premium Lounge includes a handful of worthwhile airport elements (duty-free, fine boutiques) and complements them with heaps of indulgent goodies (a full-service Elemis spa, several restaurants, cafés and bars, private meeting rooms and business centres). Hotel-style bedroom suites and child entertainment finish of this truly over the top airport retreat. The staff of this lounge at Singapore Changi International greet first-class passengers of Singapore Airlines curbside, taking their bags, before guiding them to an armchair in the first-class check-in lounge and checking them in personally to ensure all the usual stress of baggage carts and check-in queues are a faraway thought. The SilverKris Lounges, comprise meeting rooms, café/bars and 13 Italian-leather slumberettes for the ultimate in relaxation. An enormous glass dome, surrounded by chrome and wood finishings make the Swiss Lounge a breakthrough in the usual span of boring, uninspiring airport seating areas. With open architecture, heaps of greenery and panoramic views, you’ll hope your flight gets delayed in here. 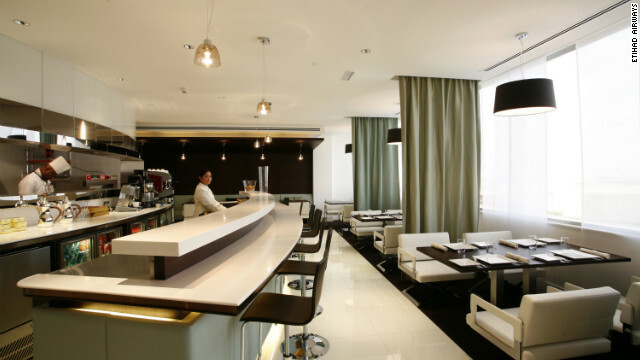 Expect warm and cold buffets, a proper European bar and a Japanese bridge in an atrium surrounded by palm trees. At Thai First Class Lounge in Bangkok, travellers can relax in semi-private rooms that function almost like a living room with couches, chairs and TVs. They can also book a spa treatment or massage in their own private spa bungalow – the only way to do long-haul.